Freedom Cole is a teacher of Vedic Astrology, Yoga and the Vedic Sciences. He teaches traditional Vedic Astrology in a practical way which is useful in the modern world. He teaches with the traditional usage of Sanskrit, meditation, chanting/mantra through modern technology. Freedom’s teachings are filled with the deep understanding of the unity of all things. Freedom was born into a family that practices yoga and has been teaching yoga and meditation since he was a teenager. He has studied with various teachers and is initiated by Paramahamsa Hariharananda Giri of Puri in the tradition of Kriya yoga and studied yoga philosophy with Bab Hari Dass of Mt. Madonna. Freedom has studied Ayurveda with the New England Institute of Ayurvedic Medicine, the International Academy of Ayurveda, the California College of Ayurveda, and mentored with various doctors in India. Freedom has an MA in Psychology and integrates the understanding of modern psychology and ancient wisdom. He is faculty at Kripalu’s Yoga Therapy program. Freedom studied with various astrology teachers in the US and India until meeting Paramguru Pandit Sanjay Rath in 2001 and studying in the lineage of Sri Achyutananda Das. He has lived for extended periods in India studying with his Jyotish Guru in in Delhi, Bhubaneshwar, Puri and the Kamoan Himalayas. He was given the diksha of the sacred thread by his Sanskrit Guru Vagish Shastri of Varanasi and was given his Vaisnava diksha by Baba Balia of Orissa. Freedom is dedicated that people have access to true Vedic knowledge within a modern context. He focuses on using this knowledge to free the mind and give a universal perspective. Freedom shares the gross, subtle and transcendental level teachings in all topics of discussion. Freedom’s personal website is www.shrifreedom.org and his Vedic Astrology website is www.ScienceOfLight.net. Workshop: The Cycles of the Breath and Cycles of Time: Chapter Six of Tantraloka. Taught with Mark Dyczkowski, January 2016. How did I get into Vedic Astrology (Jyotish)? My introduction to Jyotish was at the end of the New England Institute of Ayurvedic Medicine course where one of our last sections was on medical astrology. I saw Jyotish explain my past. Then I was shown that I could see the karma behind disease, when it started, when and if it would end. It’s an x-ray into the health of an individual, how could I practice Ayurveda without it was my only thought. So I dedicated myself to learning Jyotish. In Sanskrit, the ‘Science of Jyotish’ is called the ‘Jyotir Vidya’, which can be translated as the ‘Science of Light’ or as the ‘Goddess of Light’, for Vidya is a word that has meanings deeper than English can express. Vidya, can be translated as Science or as Goddess, because the science/understanding/wisdom is her body, science is the goddess, the Vidya. It is said that you don’t get Her she gets you, she makes you Hers and devours you. To understand Jyotish, the Jyotir Vidya must come for you. The first time I heard myself called an Astrologer was while I was working with an Ayurvedic teacher in Pune and he introduced me as an Astrologer from America. I had never considered myself an Astrologer before that, I was just having a love affair with the stars. 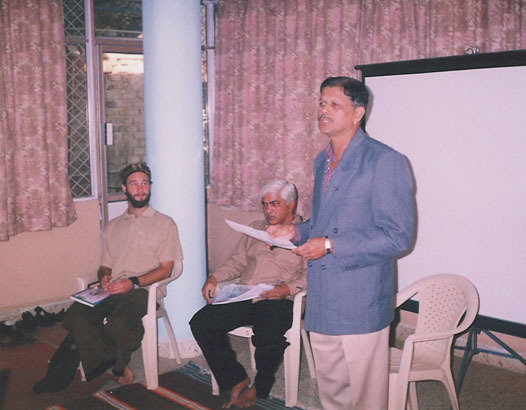 A month later I was one of the speakers at a workshop on astrology at the International Academy of Ayurveda in Pune, India. Since then I have focused on the integration of Jyotish with Yoga, Ayurveda, and Western Psychology.